This year’s Day of Archaeology will take place next week, on 29th July, and judging by the comments on their sign-up page will include many new participants this year! For those that aren’t aware, the Day of Archaeology project aims to provide a window into the daily lives of archaeologists from all over the world. The project asks people working, studying or volunteering in the archaeological world to participate in a “Day of Archaeology” each year in the summer by recording their day and sharing it through text, images or video on the website. The project is run by a team of volunteers who are all professional archaeologists, and taking part in the project is completely free. The whole Day of Archaeology relies on goodwill and a passion for public engagement! The recent discoveries of extraordinarily well-preserved 3,000-year-old homes at Must Farm in Cambridgeshire have highlighted the sophistication of domestic life towards the end of the Bronze Age, around 900 BC. But the Bronze Age was a long period, beginning some 1300 years earlier when life was very different to that of the inhabitants of Must Farm. Here we look at how technology and ways of life in England developed during the preceding millennium. Written by Dr. Jonathan Last, Landscape Strategy Manager, Historic England. Reconstruction by Judith Dobie of the timber circle at Holme-next-the-Sea. 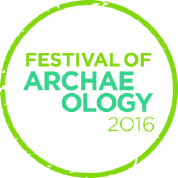 The 26th Festival of Archaeology, which runs between the 16 – 31 July 2016, is rapidly approaching, so it’s time to make plans, take a look and see what’s on in your area! Co-ordinated by the Council for British Archaeology, the Festival offers hundreds of events nationwide, organised by museums, heritage organisations, national and country parks, universities, local societies, and community archaeologists. Now obviously we can’t listeverything that’s of interest to our readers here, but the random selection below gives a flavour of the range of prehistoric events (many aimed at families) available across the country – other time periods are available. If you’re looking for a great day out you could do much worse than search the list on the festival web site to see what’s happening in your area.